When it comes to jackets, Zara would always be my saviour. I love how elegant the jackets look, even if they come with quite pricey tags but the quality, the softness are excellent. But knowing that Zara is milesss away from here that a bus ride AND a few train stops to be made just to reach the shop, I give in to online shopping. And forever21.co.jp is probably the most reliable store ever. The clothes are cheap, the delivery is super fast and you can find everything there! Once I bought a set of brushes from their online store HAHA. Talk about being lazy to shop at that beauty supply store right across the street. Zara.co.jp should REALLY exist, they won't be sorry. 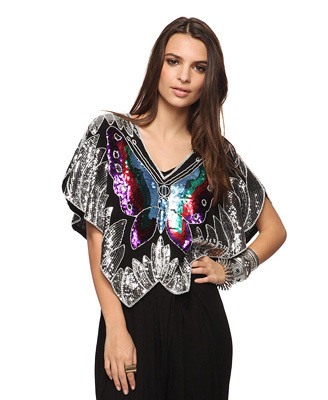 I know I won't be caught wearing the shiny butterfly top outside my house, but it is just too lovable. As for the black glitter jacket, I can wear it outside even if it's 5 degree! TOO. COOL. So Topshop-lish. But reality kicks in when I'm about to press enter. Sigh. Stoplah shopping Oren . Envy . kak sha : haha boleh je! buzz me :) skrg leather jackets pun around 2000-3000 yen ok.
uted : yea I NEED to stop..sighh. my bank account is practically screaming right now. bole tlg suggest mana yg lawa? letak kat my wall ok? hahaha. ok insyaAllah will do!